salt. The necessity of salt has produced its incorporation into symbolism and rituals. Salt is the most essential ingredient in food preservation; even Egyptian mummies were preserved in salt. During Biblical times, salt took on the meaning of permanence; therefore, the “covenant of salt” came into being. St. Mathew 5:13 states: “We are the salt of the earth.” Homer called salt “divine”. 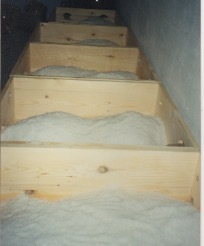 Salt played vital a role in the geographic locations of cities such as Rome, Cadiz, Spain, Tuzla in Bosnia-Herzegovina ("tuz," is salt in Turkish), and Salzburg, Austria. Societies living on grain diets, as opposed to dairy products, need extra salt. Salarium argentum, special salt rations that were given to Roman soldiers were the forerunner of “sal-ary” or “salt-money” that Eton College boys annually begged for it to help pay their expenses. After gold, it was most appraised. Arabs thought salt was ‘as necessary in food as grammar in lecture.’ Salt was a sign of hospitality. With bread it was offered to guests, see salero. Contrary to popular belief it not was used more than sugar in the Middle Ages. Salt, however, did cause the success and the downfall of empires. Control of salt mines made or broke dynasties. Salt’s role in universal history cannot be taken with a grain of salt. Governmental decrees and salt taxes and other salty factors shaped history. Salt continued to be expensive until the 16th C. when Europeans reverted to the ancient Chinese method of drilling for it. It was not only the quest for spice but also salt that incited the Spanish government to finance Columbus’ search for new trade routes, explorations in South America and the expansion of territories in what now is the United States.
) increased from 14 to 140 times the cost of production, from 1630 to 1710 thus becoming a major grievance leading to the French Revolution. During the French retreat from Moscow, most of Napoleons’ troops died due to of lack of salt their wounds did not heal. Salt helps digestion through saliva, reinforces the stomach and promotes beauty. It eases molar pain, bruises and stops bleeding. For food preservation also see adobo, geletina and aguasal.